DVD One - Starting Out. DVD/Instructional/Folk Instrmt. Cajun. DVD. Homespun #DVDPOWAC21. Published by Homespun (HL.641844). ISBN 1597730319. 5.25x7.5 inches. Taught by Dirk Powell. 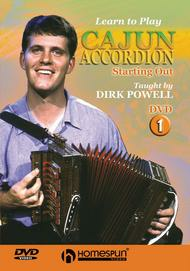 The one-row button accordion creates the defining sound that drives the waltzes and two-steps beloved by enthusiasts of Cajun music. Dirk Powell's step-by-step approach makes it easy to start playing immediately. He teaches how to hold the instrument, use the bellows, find the notes, and play “double” (octaves) - the essence of the Cajun style. Includes detailed instruction for playing some of the most popular Cajun dance tunes: La Valse de Quatre-vingt-dix-neuf Ans (The 99 Year Waltz), The High Point Two-Step, Johnny Can't Dance. 75-MIN. DVD • INCLUDES LYRICS • NOVICE LEVEL. next level of his CDs. 11 of 22 people found this review helpful. I really like the CD, because I can play along with it. It's a lot easer for me when I can see and hear the instrument being played.I would have no problem purchasing his next level CD. 10 of 22 people found this review helpful. The sheet music was very helpful on the disc but I wish I would have received instructions in writing also. It would have helped me even more.